Whether you have an iMac or MacBook (any model), there are ways to test various components of the system, which can give you useful indicators as to whether you need to make upgrades, or even buy a new Mac altogether. Benchmarking can help identify weak spots in your operating system, which could mean it’s time to backup your files or download the new macOS. Although, even without benchmarking we can tell you that if you are running Sierra or an older version, it could be a good time to update to High Sierra. At last, benchmarking can also demonstrate that your Mac needs decluttering and cleaning, as well as adding more RAM or upgrading to an SSD. Built into every Mac is Activity Monitor and other utility systems that measure performance, to an extent. In reality, none of them are equipped to benchmark the same way as iStat Menus. 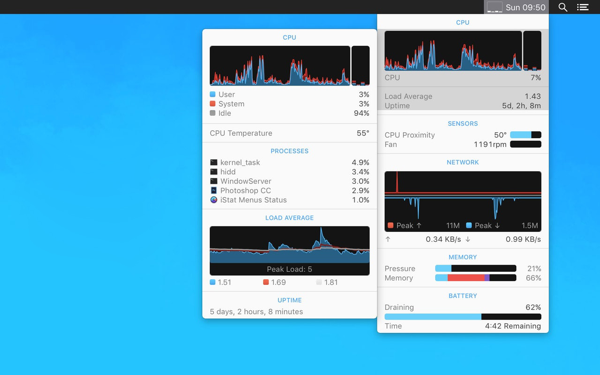 iStat Menus is a tool for benchmarking performance that is surprisingly easy to use, with extra capabilities for controlling various features of your Mac, such as fans and battery. 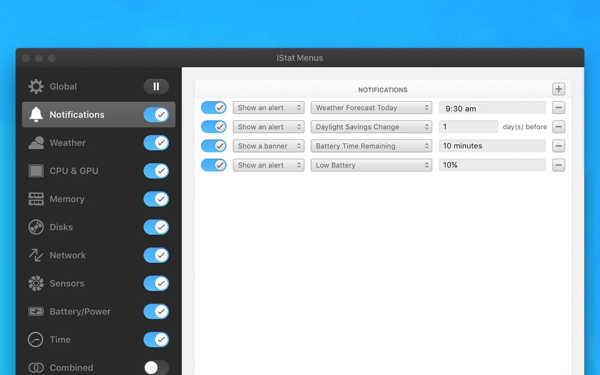 iStat Menus monitors real-time performance, showing speed and capabilities of CPU and GPU. With its intuitive dashboard, you can see memory usage and free space, a variety of read-and-write indicators and a S.M.A.R.T. status monitor for disk use and performance. iStat Menus will also spotlight the performance of hard drives and SSDs and would be of help in case you wanted to compare different Macs at the same time. One of the culprits of poor performance, especially when a Mac gets older, is being overloaded with files, documents, duplicates, and other junk that slows down the CPU and clogs the disk drives. More often than not, you end up with a Mac slowing down and potentially overheating as a result. CleanMyMac X is an effective solution and much-needed antidote to slow Mac performance. It’s a perfect way to scan, dig up junk, properly delete unused apps, tidy up email folders and attachments, and remove plugins you don't need. It can shred trash, clear caches, and declutter disks and hard drives so that your Mac is operating at peak performance again. CleanMyMac also features health monitors to avoid similar issues in the future. Disk Drill is another powerful and popular Mac productivity app, hugely useful if you ever lose files as a result of an unexpected error, especially while doing transfers from an external drive. But you can also use Disk Drill to analyze disk space, get alerts when disks are too full, or check disk vitals, such as internal temperatures and performance speeds. 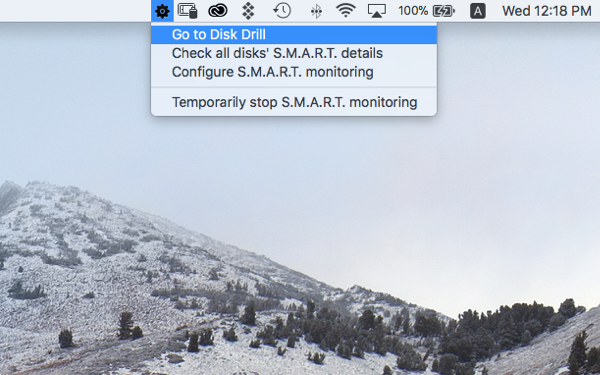 If you enable S.M.A.R.T monitoring, Disk Drill will place an icon in your menu bar, which will display your drive temperature. Click the icon to see a breakdown of your selected disk’s vitals, how much disk space you have left, and your disk’s uptime and power cycle count. At the end of the day, our laptops are workhorses, earning bread for most of us. And it would be an enormous waste to not keep them in the most productive state. Benchmarking is the easiest way to see if your Mac is falling behind. In fact, why not run one now? Download the apps discussed above and see for yourself.